How to Transfer Messages on iPhone Xs/Xs Max/XR to PC? The SMS feature on iPhone Xs, iPhone Xs Max and iPhone XR allows users to contact with family members, friends and colleagues. Thus, it is disputed that your iPhone stores some significant or pregnant messages. But it is a pity that the messages storage space of iPhone is limited. What's more, you may lose them in the unexpected situation. So you'd better copy and backup these important messages to your computer so that you are able to find them back when you miss them. 1. 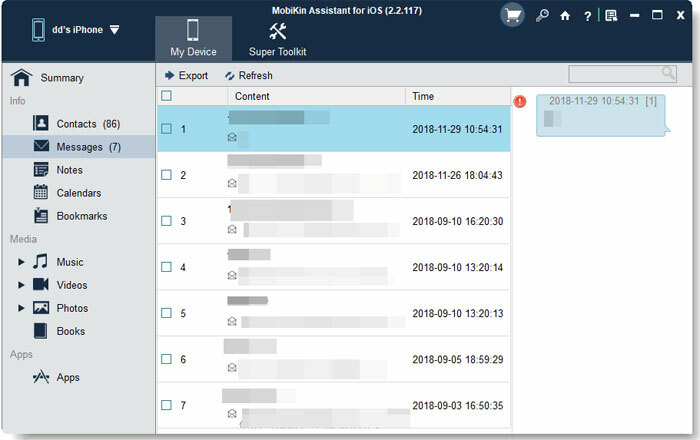 Export and backup text messages on iPhone, iPad or iPod to computer or PC as CSV, HTML, Text and DB format without hassle. 2. Transfer up to 14 types of files from iDevices to computer with several simple clicks, including SMS, Contacts, Videos, Photos, Music, etc. 3. Manage or control the transferred iOS contents on the local hard disk without any limitation. That means you can delete, remove, or add any file on your computer as you like. 4. It is fully compatible with all generations of iDevices like iPhone Xs/Xs Max/XR/8/X/7/6S, iPad Pro/Air/4, iPod mini and so on. After learning the features of this software, you may ask:" Is this tool too complicated for users to use?" Let me tell you the methods to operate this tool and you will find that it is not necessary to worry about that. Before using this program, please make sure that you have installed the latest version of iTunes on your desktop computer or it will fail to run. The followings are two download links of this product, you can click one of them according to your computer version to download and install the software. Using an USB cable to link your iPhone Xs/Xs Max/XR/8/X/7/6 to computer and then launch the program. 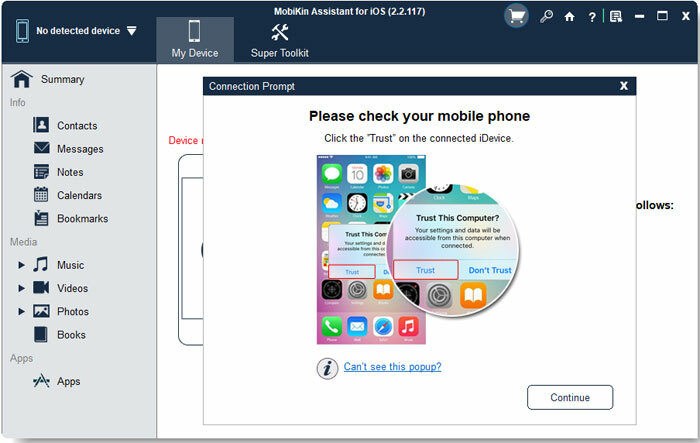 Then the tool will detect the connected device automatically and you will be required to trust the computer on your phone. Select "Messages" option in the left panel and can preview the contents. Tick the desired messages in the right pane. Click on "Export" button after confirming the contents. Here you need to decide the text format and the exporting way. Now you have transferred and backup the messages on your computer.